Can you confirm these amateur observations of Hemidactylus laevis? Type locality: Gan Lebar (= Libah? ), Golis Mountains, British Somaliland. Similar species: Records of H. laevis from southern Ethiopia (Dolo) and Somalia (‘Rahanuin country’) Boulenger (1912) were found to be misidentified H. fragilis Calabresi (Parker 1942). Hemidactylus laevis may be distinguished from all other species of the region by the following combination of features: (1) dorsum, nape and posterior part of head covered with small granules, intermixed with enlarged flat smooth tubercles; (2) swollen tail; (3) tail strongly verticillate, covered by small granular scales without enlarged tubercles. More specifically, below follows a list of characters by which H. laevis can be distinguished from other species from the Horn of Africa. Hemidactylus laticaudatus is larger (SVL up to 62 mm), has more depressed habitus, enlarged tubercles on posterodorsal side of thighs, large tubercles on tail, and more pointed head with more sunken eyes. Hemidactylus albopunctatus, H. curlei, H. flaviviridis, H. funaiolii, H. isolepis, H. klauberi, H. megalops, H. modestus, H. ophiolepis and H. ophiolepoides have homogenous dorsal scales and weakly developed subdigital lamellae. Hemidactylus barbouri, H. squamulatus and H. tropidolepis have heterogeneous dorsal scales without tubercles, some or all scales are keeled. Hemidactylus angulatus, H. arnoldi, H. awashensis, H. barbierii, H. bavazzanoi, H. citernii, H. granchii, H. macropholis, H. ruspolii, H. sinaitus, H. taylori and H. yerburii pauciporosus have large, strongly keeled dorsal tubercles. Hemidactylus somalicus and H. puccionii have tail without basal constriction, subdigital lamellae very small proximally, scarcely larger than the granules on the sole, and first supralabial excluded from nostril. Hemidactylus barodanus and H. jubensis are larger (SVL up to 70–78 mm), have enlarged tubercles on dorsum, posterodorsal side of thighs and on tail. Hemidactylus robustus has enlarged tubercles on the posterodorsal side of thighs and on tail, dorsum with 13–18 longitudinal rows of round, weakly keeled and posteriorly pointed tubercles, higher number of subdigital lamellae, and different coloration. 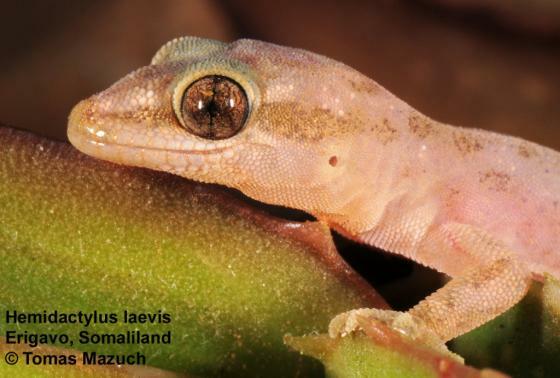 Hemidactylus mabouia, H. mercatorius, H. mrimaensis, H. platycephalus and H. smithi have conical tail without basal constriction and with enlarged keeled tubercles. Hemidactylus frenatus and H. fragilis have conical tail without basal constriction and with enlarged keeled tubercles (Fig. 5E), enlarged, smooth, and flat tubercles usually only on posterior part of body, or at least not extending onto nape (H. frenatus); H. frenatus is usually longitudinally striped or patternless, never transversely banded (Mazuch et al. 2016).